There’s little more annoying than losing your electricity in the middle of a big winter storm. Whatever the natural disaster is, you have probably experienced at least one major disaster in your life. Because of that, you may tend to linger around the generators at your favorite home improvement store when bad weather season starts. Is this the year you’ll finally install a whole-home generator? Before you swipe that card, take a look at these must-know things about choosing a whole home generator. You probably know that in some areas you can get tax credits for installing efficient whole-home generators, but what you may not realize is that a permanently installed generator can also increase your home’s value. According to Consumer Reports, a three to five percent increase in appraised value after a generator is installed isn’t uncommon. Generators are far from universal in size. You should make a list of the items you intend to keep turned on while you’re running on generator power before you start to shop. 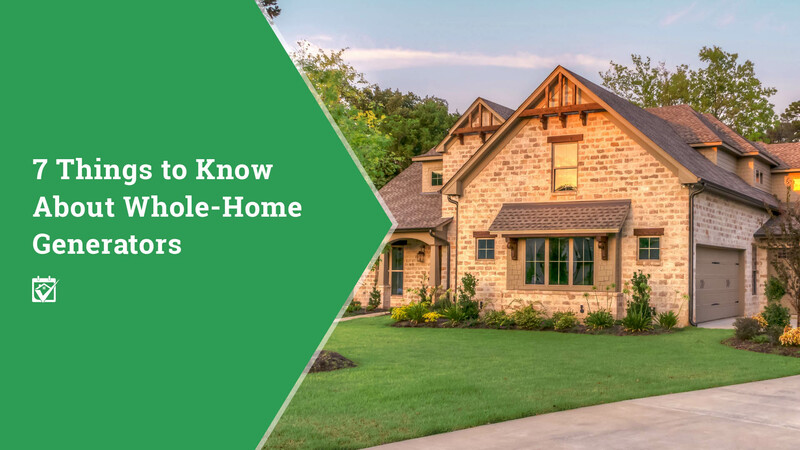 Appliances, HVAC systems, hot water heaters and even light bulbs add up when you’re talking about an entire home. Although your appliances may differ in their power consumption, in general, refrigerators use about 600 watts of electricity, your lights can soak up to 600 watts, even your computer may need 300 watts to stay running. Portable generators can be an inexpensive alternative. If you’re only hoping to keep a few lights on and maybe a small refrigerator running during a power outage, you might be able to limp along with a portable generator. These smaller units can be loud and require lots of manual intervention, including refilling their fuel tanks multiple times during prolonged use, but can push out 3,000 to 8,500 watts reliably for under $1,000. Generators run on different types of fuel. Those portable generators almost exclusively run on either gasoline or kerosine, though some can be converted to run on propane or natural gas with a special kit. A whole house generator connects to a gas line by default, be that propane or natural gas. Depending on where you live and what your utility supplies, you’ll want to choose one that matches your fuel supply. If you live in a rural area, you may have to rely on your propane tank to run your generator, keep it full through the toughest weather of the year. Regular maintenance on generators includes running them frequently throughout the year to ensure that there isn’t an unplanned problem when an emergency does crop up. Some whole home generators have an automatic maintenance cycle, allowing you to ignore them most of the time. However, these auto-run cycles can be very noisy, so you’ll want to consider the decibel level of the generator you choose. You’ll need a transfer switch, but there are several options. Transfer switches are electrical devices that allow you to change the power source that runs your home from the utility grid to your home generator. There are many different types, rated both by amps and switching type. Manual switches are less expensive, but require you to make the connection in all kinds of weather, automatic switches will flip on the generator when they detect a lack of power from the grid. Older homes may need electrical panel upgrades. Even homes that aren’t considered antiques can have very limited electrical systems that aren’t compatible with a large transfer switch. If you want to use, say, a 200 amp transfer switch and your house will only support 100 amps, either your system needs to be upgraded or your generator transfer switch will need to be downgraded. It needs to be installed by a professional. There are people who have installed their own whole home generators, but because of local building codes and the general difficulty of the project, this is not something that’s generally encouraged. You’ll be tapping into gas lines, electrical systems and you’ll need to place the unit a very specific distance from combustible materials and above areas that may flood. Storms can blow in fast and ice will bring powerlines to the ground, but you don’t have to worry with a whole home generator that’s properly sized for your house and carefully installed. We have some great referrals if you are looking to get a generator installed.